Would you know how to a save a colleague, friend or relative showing signs of severe cardiac distress, like a major heart attack? Bystanders took quick action when Formaspace’s Loddie Alspach was incapacitated during a strenuous bike ride. Be prepared to help — you and your co-workers can take CPR training and help save a life. Williamson County EMS teaches Formaspace employees compression only CPR. Monday, May 2, 2016, started out like any other day in Austin. As early Texas spring turned into summer, the temperature that day touched 80° in the heat of the afternoon. But as the day wore on towards evening, it began to cool off — a perfect time for a bike ride. That’s what our Formaspace colleague, Loddie Alspach, was doing that evening — taking a recreational bike ride down Main Street in Round Rock, Texas — the home of Dell Computer and dozens of other tech companies just north of Austin. But instead of a getting a pleasant adrenalin rush from his regular bike ride, Loddie found himself feeling rather strange — something wasn’t right. He pulled over to the side and rested for a bit on the grass. After riding a bit further, Loddie pulled over once more, laying down this time, on the grass median. Something was definitely wrong. He felt a tightness in his chest that shouldn’t be there. He tried calling his wife, but when she asked where she could come find him, Loddie couldn’t quite make sense of where he was… then he became incoherent on the phone. Do Good Samaritans Still Exist? Fortunately, on This Fateful Day, the Answer was Yes. As Loddie lay on his side, disoriented in the grass, not one but three good Samaritans came to assist. The first was a woman who stopped her car and asked him if she should call 911 for an ambulance? “Yes please!” he responded. Not long after, a man pulled up and offered Loddie a couple of chewable aspirin and some Gatorade to drink. Heart attack victim, Loddie Alspach, didn’t skip a beat to rush back and thank the first responders who helped saved his life. Then, another woman got out of her vehicle and came to Loddie’s side — offering to wait by his side until the Fire and Rescue team from Round Rock Station 2 arrived — which they did about five minutes later. 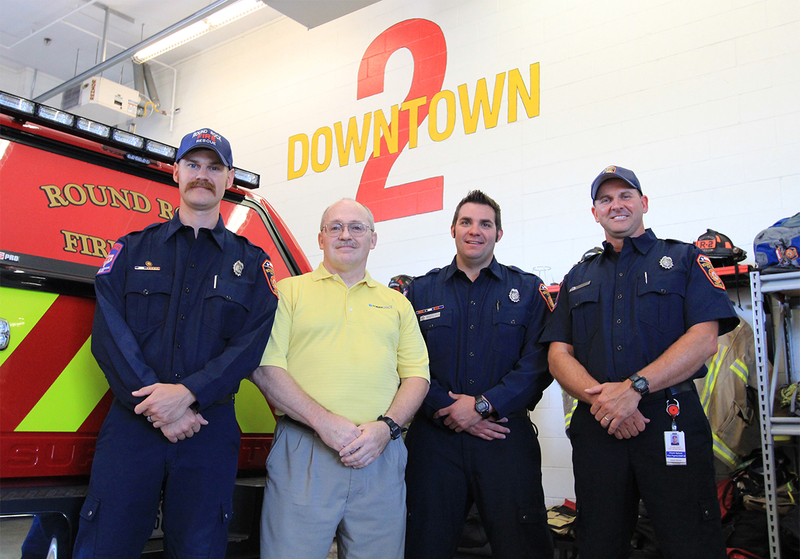 As soon as Round Rock Station 2 Fire and Rescue arrived, they hooked up Loddie to a sophisticated heart monitor and soon determined he was experiencing a major cardiac event. The first responder firefighter apologized for having to cut holes in his bike riding shirt — no worries there — and soon had Loddie hooked up with intravenous lines pumping fluids into each of his wrists. Next, the Williamson County EMS ambulance arrived. Working quickly, they loaded Loddie — now bundled onto a gurney — into their ambulance and took off. En route, the emergency responders repeatedly applied defibrillator shocks to Loddie’s chest as they raced to the Round Rock Medical Center ER. As Loddie arrived at the Emergency Room at the Round Rock Medical Center, they rushed him to the cardiac catheterization lab (or cath lab for short). Fortunately for Loddie, the treatment he received was very timely — thanks to the quick thinking of the good Samaritans who stopped by the roadside to help — and the fast response of the Round Rock Station 2 Fire and Rescue team and the Williamson County EMS ambulance service. As a result, Loddie got expert treatment for his heart attack during what physicians call ‘the Golden Hour’ — the precious first hour after a major health event when receiving medical care can have the most benefit. By the time he was admitted to ICU — after having received the balloon angioplasty treatment and the new stent — only two hours had elapsed since he felt unwell and had called his wife. Loddie’s recovery was equally swift. The next day he was able to leave the ICU for a regular hospital room, and on Wednesday (just two days after the event) he was able to go home. Thankfully his prognosis was excellent. “The heart doc said the echo showed there was no damage to the heart muscle which is almost unheard of for this level of an event,” reports Loddie. To say thank you, Formaspace laser engraved this maple top table where future trainee’s will sign in and read about this life-saving story. For those of us here at Formaspace who work with Loddie Alspach every day, we’re especially grateful that our dear friend and colleague has had such a speedy recovery from such a serious health event. Loddie himself has been shouting the praises of those good Samaritans who stopped to assist him and the professionals who kept him alive in those risky first minutes. He also wants to reach out and thank those three individuals who stopped and assisted him. As he doesn’t have their names, Loddie hopes maybe somehow they will make contact one day so he can thank them in person. Taking a cue from Loddie, each of the Formaspace employees are getting involved in CPR training. Give chest compressions hard and fast in the center of the chest when a teen or adult in found in sudden cardiac arrest. Don’t stop until the ambulance arrives. We saw firsthand with our colleague Loddie Alspach that quick action can save a life. Taking part in CPR training can help you and your co-workers, friends, and neighbors to be more confident and effective in handling a life or death situation. As we discovered when Loddie organized CPR training here at Formaspace, learning how to save a life with CPR also helps generate awareness for the important work that emergency responders at facilities like the Williamson County EMS and the Round Rock Station 2 Fire and Rescue perform on our behalf every day of the year. Why not organize CPR training at your company or organization today? It’s easy. If you are in the Austin area, we encourage you or your organization to participate in the lifesaving Take 10 CPR training classes. Training can be done in just 10 minutes — making it a great investment that could save the life of a friend, colleague or relative. In Williamson County, call 512-539-3400. In the Austin / Tarris County area, call 512-978-0022. For other areas, please visit the American Heart Association’s website to find a CPR class near you. Formaspace employees say thank you to Williamson County EMS Team with a custom-designed table they can use when recruiting for Take 10 CPR Training.